Send someone this large gift box of gourmet cookies and BIG chocolate brownies, and they'll have more than enough to share. 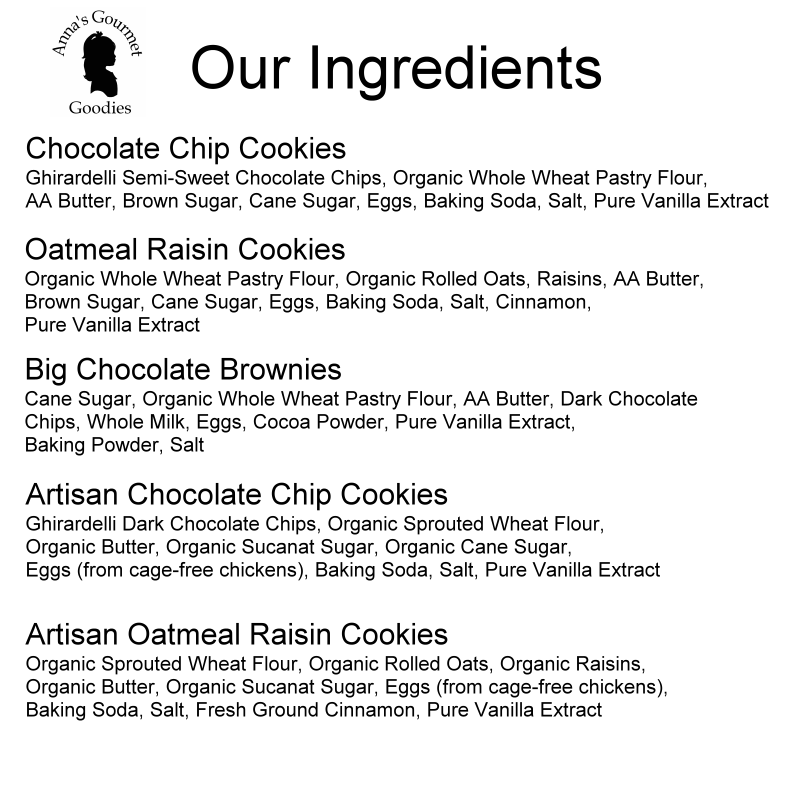 Our gourmet cookies and brownies are made from 100% organic whole wheat pastry flour, AA grade butter, farm fresh eggs, pure cane sugar and dark French chocolate. No additives, preservatives, extenders or other such nonsense in these incredibly delicious homemade treats. Just add milk and enjoy! Sharing is encouraged, but not required! Grandson says brownies are very tasty! My grandson who is in the Army says his day is soooo much better when these Brownies and Cookies arrive! Grandson is in the Army.. I sent the first batch of Annas cookies & brownies.. he said he liked them better that a previous brand I had sent.. so I just sent him his 2nd batch of Annas..
AMAZING! BETTER THAN MOM'S HOMEMADE! WOW! These cookies and brownies are better than my mom's homemade treats.... Yum! Your fabulous cookies and brownies were quickly shipped to my friend. They were positively delicious! She said your cookies were the 'best medicine' ever! What a fun way to say "Get well soon". Thank you for helping me make my friend's day brighter!!! Long Island goes kookie for Anna's cookies! Reviews from my friends & neighbors who have received my tasty gifts are over the top! They absolutely devoured & enjoyed these delicious cookies & brownies! They also were very appreciative of your enclosing notice about nut allergies!! One day I will have to order a batch just for myself!! Keep on making a wonderful, wholesome delicious product! The chocolate chip cookies were amazing and the brownies were perfect. I ordered these for myself after giving a few boxes as gifts over the holidays. Yummy. They stayed fresh for a week. The cookies and brownies could last longer but I ate them all within a week. Excellent customer service. Beautiful box. Love your cookies and brownies. The shipping is very fast and your products are always fresh. We love that your products don't contain nuts, for the many who have allergies.